So apparently there is a man who owns a Lamborghini, wears a Batman suit and travels around to hospitals to visit sick children. Admirable, albeit just a little bit unconventional. 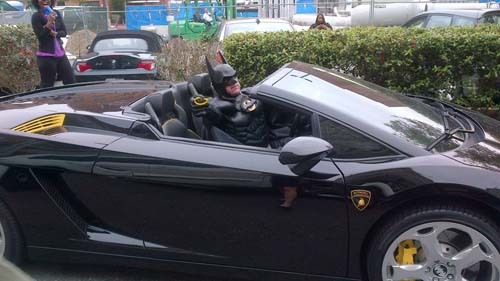 This fellow, who’s being dubbed ‘Lamborghini Batman’, paid a visit to Georgetown University last week. The media took notice when he was pulled over on Route 29. Just today, the heroic masked crusader took to a live chat for The Washington Post just this afternoon and it revealed a few secrets, such as his identity, where he got the suit and why he does what he does. Check out the full conversation here. And more about his mission in a full article here. Any Hoyas out there who ran into Batman, give us a holler. Or flash the bat symbol into the sky, whatever works for you. Previous PostPrevious Thursday Night D.C.